Precedent — what happened before? What were the decisions before? Anomalous Consequences — what are all the bad things that will happen if a certain course of action is followed? Precise Words — are there precise rules or words for this situation? Analogy — what are some analogous situations? Legislative History — intent — what has the original intent? Similar case other jurisdictions — what have other people done when faced with a similar problem? First principles – Public Policy — what is good public policy? Precedent — Robert identifies consistency as a key influencing factor. People like to be consistent with what they have said or done before. Precise Words — Authority is a key influencing factor and it is the authority of the exact language that gives it its weight. Analogy — Consensus is a main factor in persuasion and analogy uses it because it shares what other people have done in similar circumstances. Legislative History — This is another factor that taps into authority as a factor — what does someone who is an expert have to say is similar to looking at what people who drafted or passed a law said on the subject. Similar case other jurisdictions — Consensus is another key influencing factor. People look at what others have done in similar situations. 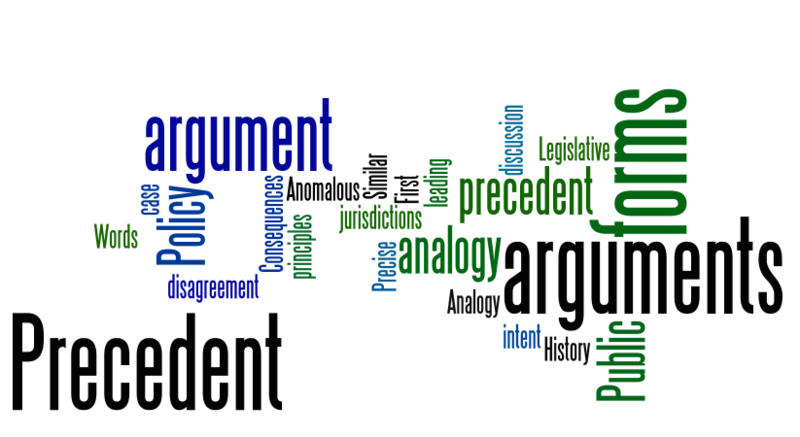 I have always liked the list of seven forms of argument and review them when I’m trying to make a case for something.